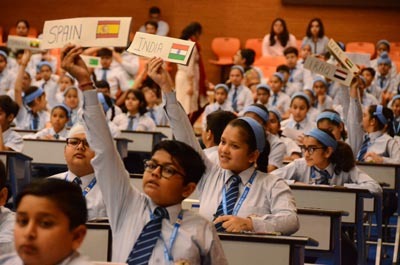 Ludhiana, April 01, 2019 (News Team): As a step towards preparing students to be cognizant and responsible citizens of tomorrow, the Intra Model United Nations was organized at Sat Paul Mittal School. The event was marked by two days of intense debate and deliberations on the agendas ‘The Issue of Kashmir’ and ‘The Israel- Palestine Conflict’. After a cycle of debates, negotiations, discussions and reflections on the agenda, following resolution was adopted in the general Assembly, the working paper given by India and its allies was passed unanimously. Pakistan, in it its working paper, indirectly supported the idea of Kashmir being a part of India by referring to the need to repeal of article 35A and article 370 which happens to be the only barrier. In the Security Council, the working paper proposed to revive the UN Trusteeship council to administer the disputed territory between Israel and Palestine. In the General Assembly, Islamic Republic of Pakistan was adjudged the Best Delegate while the High Commendation went to People's Republic of China and The Republic of India. The Delegates of Canada, Saudi Arabia and Iraq were awarded Special Mentions and the delegates of Bhutan, Qatar, The United States of America & Cuba were given Verbal Mentions. In the Security Council, the delegate of The Russian Federation was adjudged the Best Delegate and the delegate of Belgium got the High Commendation. The Special Mention in the committee went to the delegate of Dominican Republic and the State of Israel. The verbal mention went to the delegate of Syrian Arab Republic, The United Kingdom and Republic of Turkey. The MUN culminated with a resplendent and radiant closing ceremony. The Prize Distribution Ceremony was followed by the address delivered by Nipun Jain, the secretary general, who appreciated the wholehearted participation of all the delegates, teachers and dignitaries in event which can best be described as ‘one of its kind’ and conveyed his gratitude for making it a huge success. The event concluded with an insightful video that threw light on the carefully chosen agenda of the Conference. Nipun Jain, Secretary General, Intra MUN 2019, declared the conference closed.